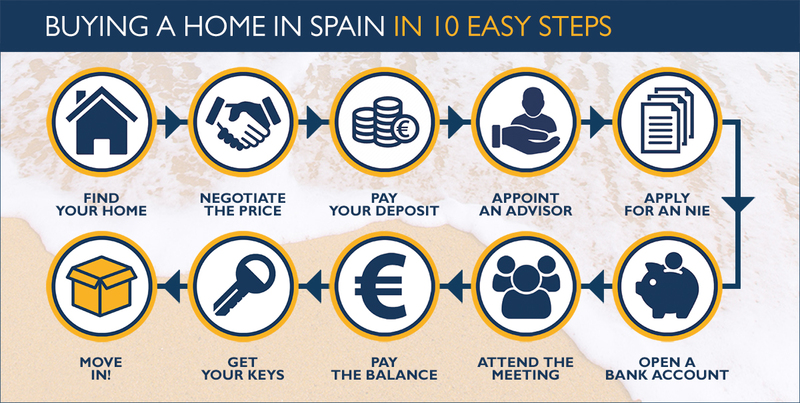 The process for buying Spanish property is thankfully uncomplicated, so if you take some time to understand the order in which things happen, and you know what you will be expected to pay at the start of the process, you should avoid any unexpected surprises or expenses. When preparing your budget for the purchase of a property in Spain, it´s important to consider the total expenditure that will be needed to secure your new home and when you will be expected to pay. Once you have found your perfect property in Spain and negotiated the sale price with the estate agent, you will be required to sign a reservation contract. This commits both buyer and seller to complete the sale. You will be asked to pay a reservation deposit to secure the property at the price agreed between you and the seller. This, depending on the agreed base from 3.000 € up to 10% of the purchase price and will be deducted from the final sale price upon completion. If you have not done so already, you will need to apply for a Spanish fiscal identification number known as an NIE. You cannot buy a property in Spain without an NIE, and we can apply for an NIE on your behalf even if you are not physically present in Spain. If a property is to be registered jointly, each person will require their own NIE. We can organise an NIE on your behalf, just click here for more information. You will also need a bank account in Spain. Applying for a bank account is relatively straightforward and cost free, requiring only your current address and a valid passport to prove your identity. You will need to appoint a Spanish advisor (an abogado or a gestor) who specialises in conveyancing work. Your advisor will work on your behalf to ensure that the essential paperwork is in order, that there are no debts secured on the property, that all appropriate permissions are present, and that everything is in place to allow the sale to proceed without complications either now or in the future. The costs of appointing an advisor to administer your property purchase in Spain varies, but expect to pay around 1% of the purchase price. We charge a variable fee for our comprehensive conveyancing service depending on each transaction and additional services provided, speak with us for a competitive price. Your advisor will arrange a date for completion of the sale that is suited to both buyer and seller. This meeting usually takes place around 4-6 weeks after the purchase price has been agreed, but it can be sooner or later depending on the individual circumstances of the sale. The meeting will be arranged at a Notary´s office with both buyer and seller or, their representative present. In case you are not able to travel and assist the notary appointment, you can provide a power of attorney to your lawyer or advisor, who will then represent and act in your behalf. It is at this point that you will be asked to provide the remaining funds to cover the purchase price of the property, either in the form of an electronic bank transfer or in bank draft. In either case, the funds must be transferred in Euro´s and usually payment in other currencies cannot be accepted. As a buyer, you will need to pay a purchase tax called IPT, or Transfer tax. This is paid to the Spanish Tax Office (Agencia Tributaria) subsequent to completion and amounts to 10% of the property´s purchase price. Other regions in Spain vary from 5% to 10% of the purchase price. There can be some complication and misunderstanding regarding the roles played by a Notary and your advisor. Whilst an advisor can be appointed to represent your interests, a Notary is a registered legal representative of the Spanish government and operates independently of your interests. The Notary oversees the completion transaction between you and the seller, ensures that the balance of the purchase price and taxes are paid in full, and manages the signing of the deeds (the escritura). Notary fees vary depending on the purchase price of the property, but typically cost from €600 to €1,000. Once the contract has been concluded the Notary registers your property with the Spanish Land Registry (Registro Catastral) in the new owners name(s). There is a fee payable for registration which is generally half the cost of the fee charged by the Notary. A reputable estate agent will have an advisor or consultant that works on your behalf to ensure that the utility contracts for water and electricity supply (and gas and telecommunications if applicable), are transferred correctly in to your name as the new property owner. 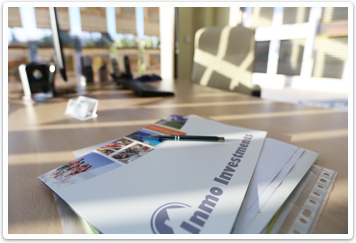 At Inmo Investments we will help you will all neccesary arrangements for setiting up the supply contracts and the direct debit through your spanish bank account. As a rule of thumb, allow an additional 12-15% over the agreed purchase price to cover additional expenses associated with the purchase of a property in Spain. Costs will differ for new build properties, and if you intend to apply for a mortgage you will incur additional costs. 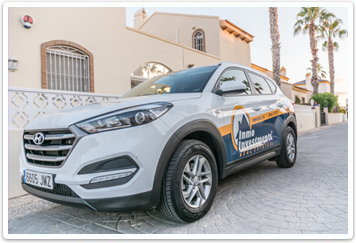 Inmo Investments is one of the most trusted names in Costa Blanca real estate and provides a property conveyancing and after sales service. Established since 2003, we have helped thousands of people make their overseas property dreams come true. Contact us and let us guide you through the buying process.